I'll go through the steps I did to make my Macbook usable. All the applications that I use are(or were) free at the time of writing. This leaves three finger swipes to app specific swipe shortcuts. More from them later. 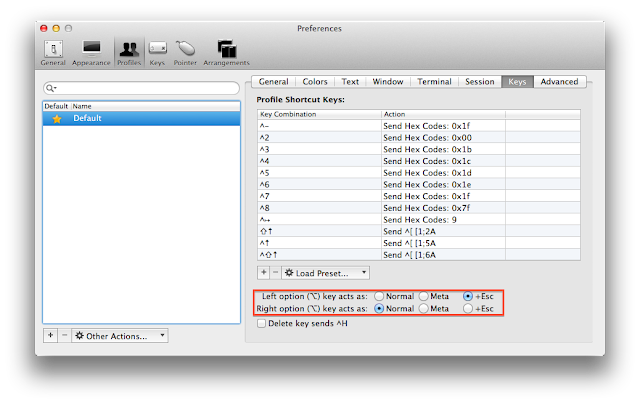 In my layout § key is the key above Tab. This is bearable but the window switching should work like the app switcher. There should be a "stack" of last used windows. Now if I want to specific window, I first switch to the app and then find the correct window of the app. When switching to a minimized app, workspace will be switched where the window should be, but the window stays minimized. Why? I would want it to be shown(unminimized?). Use Cmd - Hto hide windows rather than minimize. This button is a mystery. I thought it was the maximize button, but instead it's called 'zoom'. Apparently it tries to make the window bigger somehow. It doesn't work at all. The behavior isn't consistent between applications. 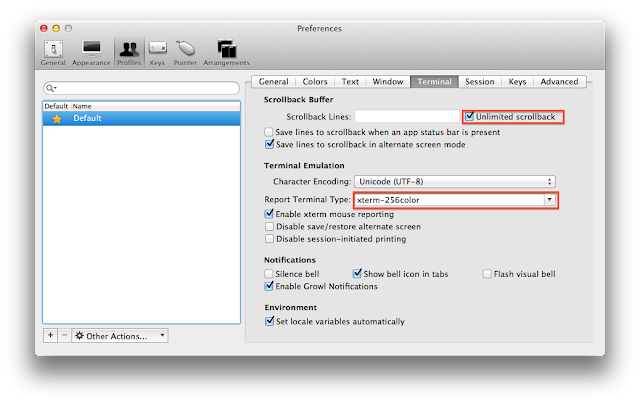 Download iTerm2, it is great. Added ':' character to Characters considered part of word for selection. Checked Unlimited scrollback. Changed Report Terminal Type to 'xterm-256color'. I have Finnish keyboard layout so pressing Alt - 2 produces '@' character. Therefore I changed only left Alt to act as Meta. It makes possible to switch channels in Irssi with left Alt. After all I ended up using Macfusion. First you must install OSXFuse from https://github.com/osxfuse/osxfuse/downloads. Otherwise the Macfusion does not work. I have set the mountpoint to Desktop. After installing a bunch of apps, I want some of them to be easily accessed. 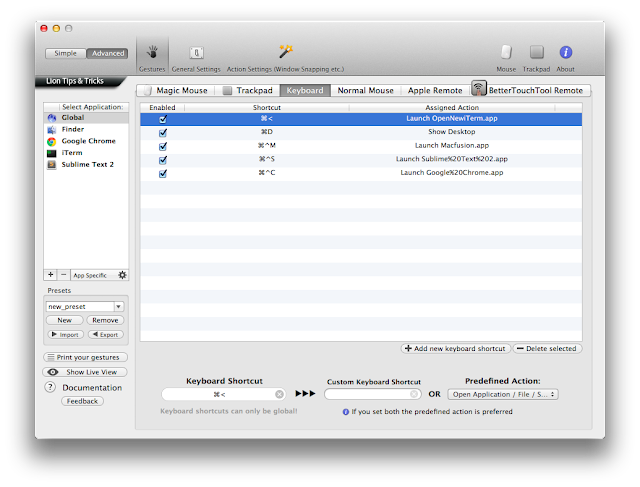 Assigning some keyboard and swipe shortcuts is the way to go. 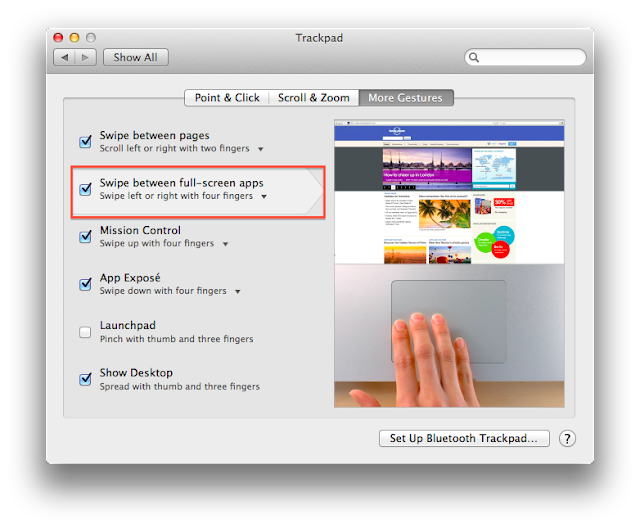 To customize them, download BetterTouchTool. It handles shortcuts for Trackpad, keyboard, Magic Mouse and normal mouse. 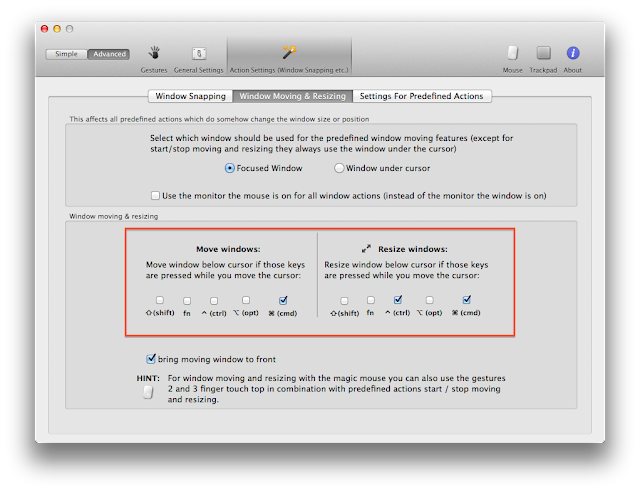 Change these settings to move and resize windows easily. 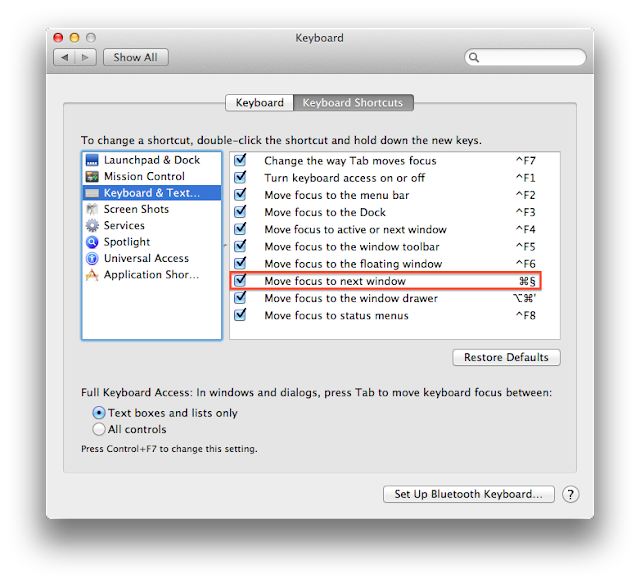 These shortcuts don't always work as expected, but they are good enough. First click Add new gesture, then modify it to your needs. 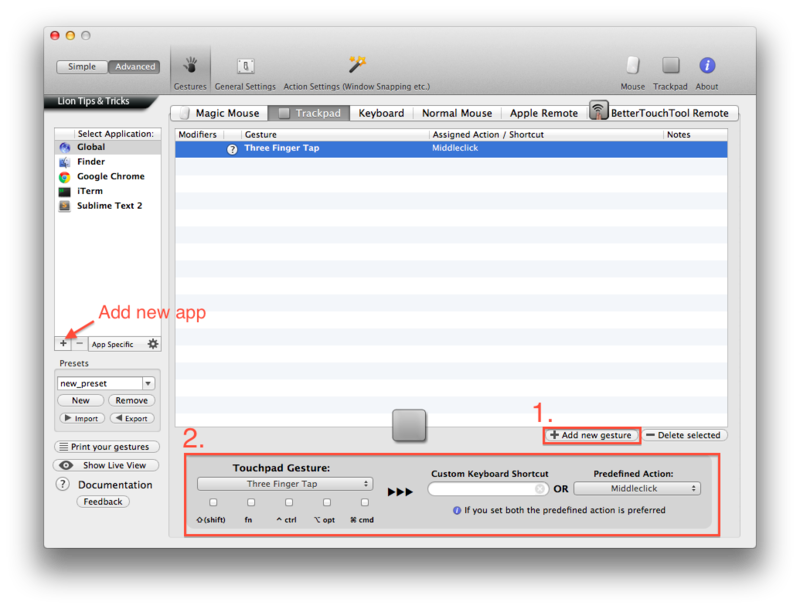 To add app specific shortcuts, find out the application's keyboard shortcut for the action. For example Chrome closes tab with Cmd - W. Then bind a gesture to that keyboard shortcut. This way I can close tabs and open links to new tabs in Chrome with three finger tap. These commands are to help using Irssi. Exactly the same shortcuts than in Chrome. 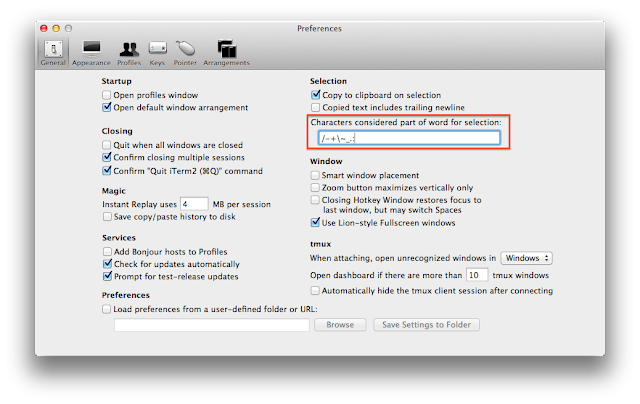 iTerm doesn't open a new terminal window when it is launched. 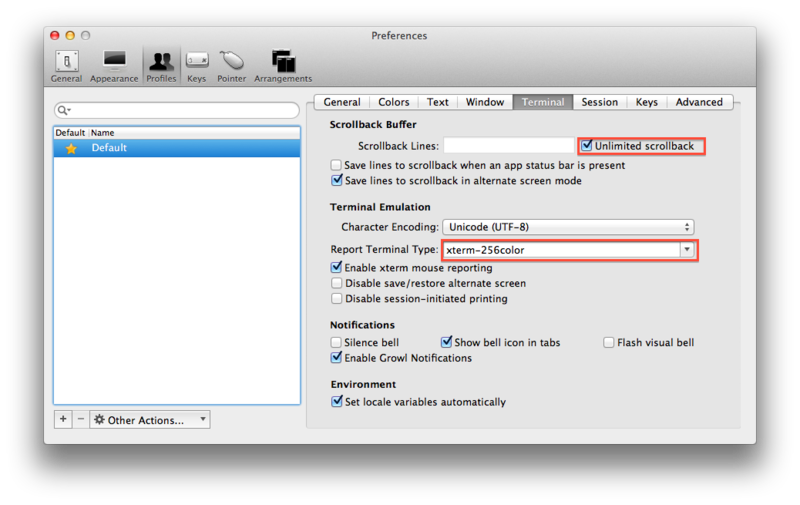 To make it happen, you must create an applescript that does it. I followed these instructions: http://apple.stackexchange.com/questions/46224/how-to-make-clicking-on-icon-in-dock-open-new-instance. After that, move OpenNewiTerm.app to /Applications and bind a keyboard shortcut to launch it. There have been many annoyments but I can't remember them all. Download StartNinja. It is pretty straightforward to disable the startup sound with it.